So about a year and a half ago, Harold Jarche introduced me to Dave Gray, whom he met at a conference. Dave was writing a book about agility; Harold told him about my work; Dave wanted to talk. He was interviewing lots of people for his book. I said yes, and thus began a fascinating discussion about agility, evolution, complexity, uncertainty, change, trickster figures, and stories. Later I enjoyed the privilege of being among those who commented on the book manuscript, and now the book is set to launch. The concept of liminality, which has to do with in-between thresholds, is well known in anthropological research, where it refers mainly to rites of passage such as marriage, birth, and death. Dave has expanded his phrase "liminal thinking" into what Victor Turner called "liminoid" (that is, liminal-like) experiences -- those that do not involve traditional rites of passage but that have an in-betweening quality to them all the same. Such liminoid activities are typically pursued as a form of playing purposefully with possibility. (Does that sound familiar?) 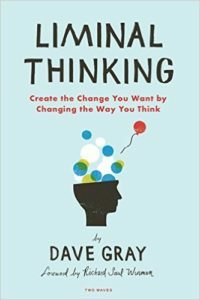 In his book, Dave takes the idea of such playful liminality and blends it with several related ideas (double-loop learning, Zen practices, brainstorming, story sharing) to produce a clear, concise, witty, and enjoyable refresher course in opening your mind to possibility. I've read so many books about dealing with complexity. Most of them tell us that we can go on doing things the way we've always done them as long as we carry around some totemic words like "fractal" and "strange attractor" and "emergent." Liminal Thinking is different. It may be the first book I've read that challenges its readers to live more effectively in a world that seems (but isn't) newly complex (and complicated). I wrote a blurb for Dave, and I'm not sure if he ended up using it, so I'll throw it in here. Ever since I found out about Liminal Thinking, I keep thinking of it at strange times, in-between times, surprising times. I keep thinking, wouldn't it be great if this person was exposed to Dave's book, or, here's what I'd like to say right now, it's right here in Dave's book, or, I feel a need to reread this part of Dave's book. I take these messages as signs that Dave's book is a book we all need, even if we don't all know it yet. I can't wait for everyone to discover it. I can't wait to get my copy so I can read it all over again. Here are links to get a look at the book and support its launch.